There are very few angles on the 100th anniversary of the Titanic tragedy that aren’t being excessively covered in other places this week. So instead of focusing on the ship and its passengers, I thought I’d look at some Titanic-associated places in New York that haven’t been as breathlessly described or breathlessly refitted for 3-D.. For instance, the Chelsea Piers golf driving range. The once-great West Side piers of the Gilded Age’s finest luxury vessels sat mostly haunted and decrepit by the 1950s. The lust for ever grander vessels ultimately created boats that were too big for the piers to accommodate. Midtown piers took most of the traffic by the 1940s, and there seemed little to save along the western waterfront by the 1970s. Some piers burnt down and were never replaced; others became drab parking garages; and still others, a wonderful place to find a gay hustler. Pier 59 had once been the berth of the White Star Line with a glamorous Beaux-Arts dock designed by Warren and Wetmore of Grand Central Terminal. By the 1990s, developers looked again hopefully for the pier to draw people of means. “This is where we’ll put the golf driving range,” said a developer of the Chelsea Piers Sports Complex to New York Magazine in December 1994. The immense rehabilitation project had already begun by then and would soon envelop four former piers. In June 1911, this pier welcomed its largest visitor, the White Star Olympic liner, on its maiden voice. The Olympic just happened to pass the Cunard’s Lusitania in the New York harbor that morning. 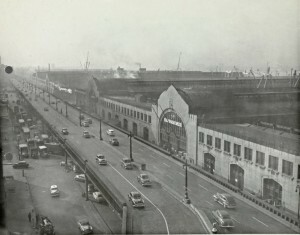 Of course, Pier 59 was to have greeted the Titanic on its arrival here on April 17, 1912, and leave again on April 20. But the gloom that hovered over the pier hardly slowed ocean traffic. The Olympic would continue to use the pier until it was pulled from service during World War I. On August 13, 1914, the ship Philadelphia arrived here with the first Americans fleeing the war. Although most of the shipping industry avoided using Pier 59 by the 1960s, it did occasionally get some unusual arrivals. In 1960, the freighter Pioneer Tide arrived here with some unique passengers — 13 one-humped camels.